In 1856, long before either Massenet or Puccini composed their ‘Manon operas’, Auber composed a Manon Lescaut. This unfamiliar Manon was put on stage for five performances only by the Opéra Royal de Wallonie. The result was a unique and musically extremely satisfying production. Even though he was quite successful in his day and composed as many as 48 operas, Auber and his operas have slipped into obscurity. Some may have heard of his opera La Muette de Portici in relation to the Belgian revolution, but that’s generally about it. Auber’s librettist Eugène Scribe adapted Prévost’s novel rather freely. His Manon is tempted by luxury, but barely gives in to it. Much stronger is her love for Des Grieux, to whom she is faithful during the entire opera. The character of Des Grieux disappears into the background, and there are no protracted love duets or scenes between the two lovers that really help to convince the audience of their love. Furthermore, Scribe and Auber elaborate the role of the Marquis d’Hérigny, a character absent from other ‘Manon operas’. This Marquis functions in the plot as a type of Scarpia. He has taken a fancy to Manon and makes sure that Des Grieux’ fate is in his hands. In order to save Des Grieux, Manon has to promise never to see her lover again and live with the Marquis in luxury. As Manon is admiring the luxuries of the Marquis’ home, Des Grieux comes in and asks Manon to flee with him immediately. Manon, however, insists on enjoying a fancy dinner first. The Marquis comes in and chaos ensues. Des Grieux stabs the Marquis and both Manon and Des Grieux are arrested. Des Grieux escapes punishment, but Manon is deported to Louisiana in order to ‘people the colonies’. Des Grieux saves her in the nick of time and the two flee into the wilderness. Here, Manon dies, as she does in Puccini, even though she spends more time imploring God as a repentant sinner than anything else. Scribe and Auber also add another character, Marguerite, who acts as a foil to Manon. She is engaged and works hard as a seamstress in order to join her fiancé in the colonies and get married. She is very devout and of an almost angelic goodness, even giving Manon her wedding dress to help her escape in Louisiana. The music of the opera can best be described as Rossinian with a French lyric warmth to it. It has some extremely difficult music for Manon, who has to display extreme vocal acrobatics. 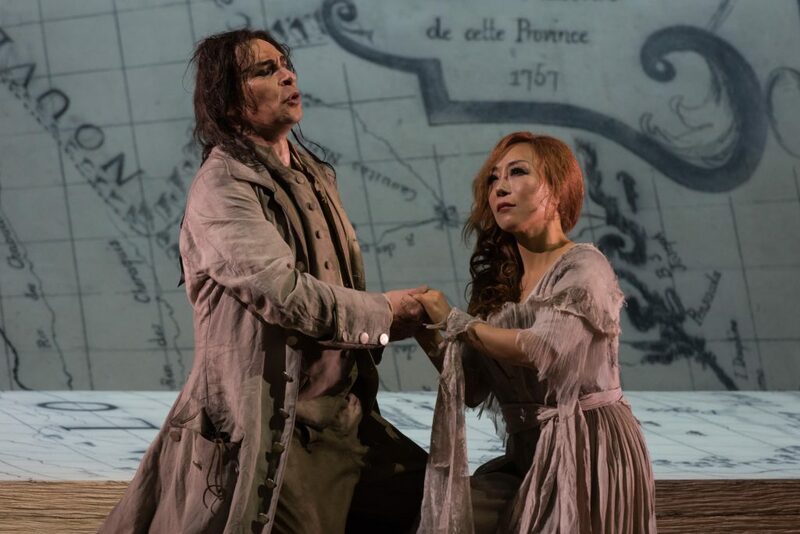 In Sumi Jo, the Korean soprano, the Opéra Royal has found a perfect Manon. She managed to communicate the youthfulness of the character wonderfully, and has an extremely agile voice that is preserved very well. 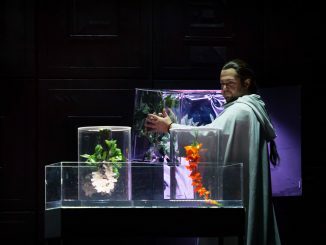 Her Des Grieux, the tenor Enrico Casari, possesses a nice ringing voice, but failed to portray his character convincingly. In the final scene, his Des Grieux stood feet away from his dying lover, with his back to her, seemingly barely registering her existence. This detracted greatly from the potential dramatic impact of the scene. The Marquis d’Hérigny was performed convincingly by Wiard Witholt. The Dutch singer was only asked to sing the role a week before rehearsals started, learned it very quickly, and delivered some wonderful singing. What his voice lacked in agility, it more than made up in warmth and roundness. Special mention should go to the Marguerite of the young Belgian soprano Sabine Conzen, who acted very convincingly and sang with a tender, solid voice. She was a very welcome addition to an all-round good cast and chorus. The orchestral aspect of this performance was in the excellent hands of the young conductor Cyril Englebert. Under his direction, the orchestra played passionately but without ever becoming sloppy or imprecise. The production by Paul-Émile Fourny is very traditional with lavish period costumes and works for the most part, although more attention could have been paid to the final act. Whatever Des Grieux sings that he is feeling as Manon is dying, he is surely not showing it. Perhaps part of this are limitations in acting abilities on Enrico Casari’s part, but for the most part, the basic positioning of the singers should have been handled better by the director. Fourny adds an extra layer to his directing by opening the opera with a group of schoolgirls sitting in an old library. They’re studying and reading books and passing them along. 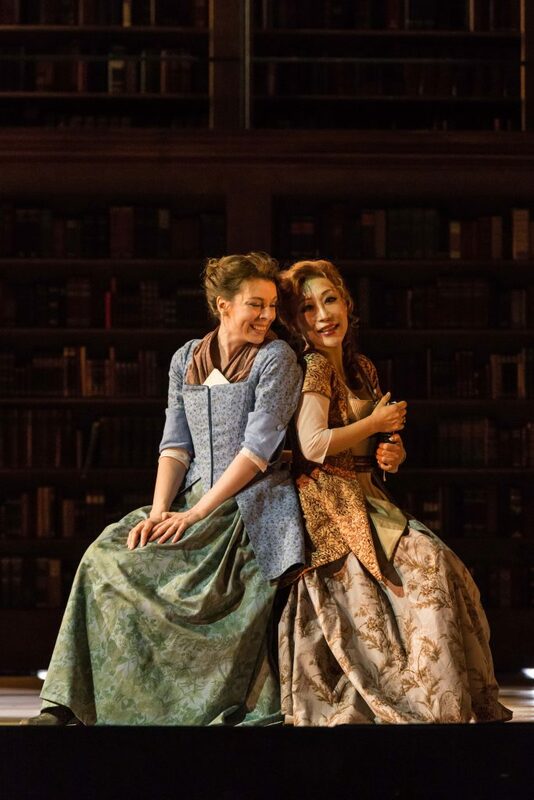 As the girls disappear and the opera itself starts, elements of the library are still visible. Book imagery returns most strongly in the final act, where Manon expires on an extremely large book which is opened to a page on which the map of Louisiana is shown. After Manon’s death, a schoolgirl appears and hands in a finished book to a librarian. It’s not quite clear what the exact point of this addition is. Is it to show that the story of Manon is based on a book? Is it meant to make the audience aware that they are witnessing a piece of fiction? Or is it meant to show how readers visualise novels by means of their imagination? 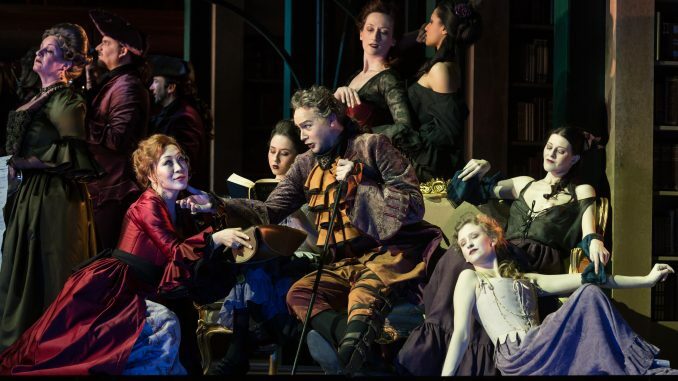 At any rate, the Opéra Royal de Wallonie deserves ample praise for the daring it shows in putting on such a forgotten work. The opera house continues this tradition with its staging of the Verdi rarity Jérusalem next season.